A few days ago, I was contacted by POW!, (the title's publishers), asking if I wanted an advanced copy of the book for review. Upon giving them my address, found out the cheapskates wouldn't ship it internationally. Instead I received a PDF of the proofing copy. Sadly, this didn't contain any exclusive Elite darts so I drew on some standard darts and stuck them to my computer instead. I have read the whole thing cover to cover and I am afraid to say, it isn't quite what I expected. When Adult Fans of Nerf first announced the books existence back in May, I almost wet myself with excitement. Especially after I read the description posted on Amazon.co.uk. "Pore over these pages to discover the amazing spectrum of NERF blaster designs and accessories, from the very first NERF product, a simple, orange foam ball developed nearly a half-century ago, to the birth of the blaster in 1989, to increasingly sophisticated models like the innovative N-Strike Elite series, which began in 2012, and ending with a sneak peek at the blasters of the future! 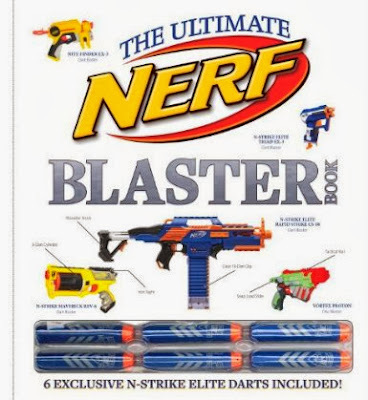 NERF: The Ultimate Blaster Book is a comprehensive and exhilarating tour of NERF blasters, the popular action toys. Jam-packed with striking photos and intriguing facts, this hardcover, full-color collector's encyclopedia is heavily detailed with high-energy spreads, an array of technical specifications (range, capacity, propulsion type, and more), and callouts explaining special features, as well as the in-depth history behind each blaster evolution." Based on this description, I really believed that 'NERF: The Ultimate Blaster Book' would be just that. A detailed "encyclopaedia" covering the full history of the NERF brand. I am sad to say, this book does not. Although very well written, researched and presented, I feel that this book is more of a NERF brochure than a concise history of blasters. Notwithstanding my initial disappointment, this book does contain some interesting information and you can see how the author has collated information from Hasbro, collectors and nerfers alike. It seems to me that Nathaniel Marunas is a nerfer himself. Although there is nothing in the foreword as to why he decided to create this book in the first place, I like to think that rather than being commissioned by Hasbro to make money, this book is a work of a fan who just wants to write about his favourite toy. The book begins with a very brief history of the NERF brand. Starting as we all know, with a simple foam ball and then eventually evolving into the blaster we have all come to know and love. Amidst this story, It was nice to see that the origins of the name 'NERF' have now been officially confirmed, finally dispelling that awful theory that NERF stands for 'Non Expanded Recreational Foam'. Now it is immortalised in text, straight from the horse's mouth. I hope this can be an end to that rumour. The chapter goes on to give an overview of blaster evolution from the first ever 'dart blaster', the Sharpshooter, right up to the Elite line. From the original Mega Dart to the brand new MEGA Dart, the history of the NERF projectile is well documented. Images of each type of dart are included alongside data such as size and variations. There is also a very detailed account of the design of the new MEGA Dart and the reasons behind it's development. This section covers every 'light blaster' across the N-Strike, Dart Tag, Vortex and N-Strike Elite ranges. Every blaster is laid out with a brief description, a selection of stats; such as capacity and year of release, and images of the different variants like the Whiteout, Gear Up, Clear and Sonic versions. Some of the blasters are shown with a call out giving additional factoids about them. This chapter covers everything from the Barricade through to the new Blazin' Bow. It is laid out in the same fashion as the previous chapter giving a description, stats. and facts about blasters across all of the current ranges. Incidently there is no mention of the MEGA Magnus. With this blaster's release thought to be imminent, it seems strange to me that it's entry was omitted from the book. Interestingly, this section contains a run-down of the different 'Propulsion Systems' used in the various NERF blasters. Direct plunger, reverse plunger, compressed air, motorised plunger, flywheel, and torsion spring systems are all described along with internal pictures. To my knowledge, this is the first time ever that Hasbro have given us an 'official' look inside NERF blasters. For members of the NIC, this is all information that is already widely known but for the casual nerfer, I can imagine this is all really interesting stuff. Everything beefy from the Unity Power System from 2003, right through to the brand spanking new MEGA Centurion. This section includes an article that gives a really interesting insight into the creation of a NERF blaster. Using the Vulcan as an example, the article takes us through the entire design and development process for a blaster. It is interesting to see that after an initial design, the mechanism for the new blaster is mocked up using parts of other blasters. In the case of the Vulcan, a Maverick was turned into an automatic, belt fed blaster as a sort of 'proof of concept'. It was also interesting to learn that the Vulcan was originally designed to have rotating barrels. How awesome would that have been? One of the most important aspects of the NERF line (at least for me) is the ability to accessorise your blaster and optimise it for your own personal style. For me, this is one of Hasbro's biggest successes with the line. No other blaster manufacturer creates as many different accessories. It is such a shame that they do not realise this and create a bigger range of customisation options (hint, hint). This section includes everything that can be attached to a blaster or used alongside it. I just wish there was more (hint, hint). Possibly the most interesting page in the book is the 'Foampower Timeline'. This is, as the name suggests, a detailed timeline documenting all (or at least most) of the NERF releases from the NERF ball in 1969 through to the MEGA Centurion in 2013.
a sneak peek at the blasters of the future!". In actual fact, what we get is a black page with the words "Get ready. They are coming..." and the Zombiestrike logo. Nice try but the ZS line was released months ago. All in all, this book is not too bad. All of the blaster descriptions seemed to come straight from Hasbro's PR. It would have been nicer for the author to have written these in his own words. The supporting facts and stats are something that we have seen from the NERF 'Top Trumps' cards but made the information in the book a little more interesting. They certainly filled it out a bit but it didn't really tell the reader anything new. By far, the best bits in this book were the small articles that gave us an insight into the design and development behind our favourite NERF blasters. It would have been cool if we could have information like this about every blaster, but I guess this wouldn't sell as many books. Ultimately, I just wish the book could have lived up to the Amazon description and been a concise history of the NERF brand. A sort of collectors guide if you will. Marunas does state in his foreword that the "definitive guide" to NERF is yet to be written. Let's just hope that this book can inspire others to write as well. Ok, so I need to know if there's any info on my "hydro torpedo" that I found a while back. You can find it on n-rev. I need to know what it's real name is and what line it came from. As far as I know I am the only person on the planet to actually own one in complete working order. All others ( that I know of which is 1) were stripped for parts because they were broken. I don't want a preview I just want to know if it was a test blaster that got leaked out somehow or an actual released blaster that was just very exclusive to a con or to someone inside the company. Any feedback would be nice. My name is Nitefinder_King on n-rev btw. I had another skim through of the timeline and I'm afraid there is no mention of the 'Hydro Torpedo'. Like I said, this book is far from being a 'collectors guide' so it is not surprising to me. As a collector myself, I am intrigued by your blaster. Very interesting indeed. I hope you find the answers you want, I'm just sorry I can't give them to you. Had a look at your N-Rev topic and I'm afraid you're barking up the wrong tree here. Your blaster appears to be a late LARAMI blaster. I think your best bet might be to ask on one of the Super Soaker forums as water guns were LARAMI's bread and butter. Hold on to it and keep on looking for the answers.